Difference between revisions of "1981-1990 Mazda Cosmo"
In late 1981 the third-generation Cosmo was debuted, marketed at the higher-end of the passenger/performance car market. 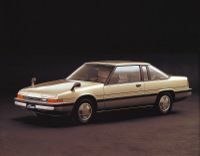 At first all models (two and four-door hardtops and sedans) were fitted with the 12A six-port injection engines as seen in the naturally aspirated RX-7s, but 13Bs with electronically controlled super-injection and a 12A with Mazda Impact-Turbo was soon added to the Cosmo's specification. This turbocharger set-up was the world's first rotary turbo system in a production car, and paved the way for future rotary turbo engine designs. Cosmos also featured electronically controlled four-wheel independent suspension. This page was last modified on 20 May 2012, at 21:53.